one by one with special care. 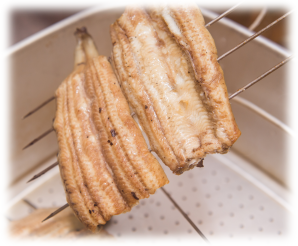 Over 30 years of its history in Shuzenji, Shiki has never changed its way of cooking unagi. Unagi served at Shiki are domestically cultivated and carefully selected by the owner. Process of spiking unagi to the cutting board, filleting, skewering, steaming prior to grilling and grilling; the quicker the process goes, the better unagi tastes are extracted. Grilling technique handed down for decades is the key to make unagi crispy outside and juicy inside leaving its fragrant smell. The original sauce is the final touch to make the Shiki’s unagi. Shiki's unagi is full of the owner's passion,and every single process; steaming; grilling; dipping into its original sweet-savory sauce; dishing up is performed without any compromise. Unagi is not only the specialty of Shiki. Its special beef stew is very popular. Other dishes such as steak and Japanese style croquette are the ones you should give it a try. Large-number parties such as family gatherings or groups or business meetings can be accommodated. Shiitake mushrooms used in the Izu no Hana have been grown on the natural wood. The homepage of “SHIKI” has been created! Try our unaju, grilled and sweet-savory glazed unagi resting on a bed of rice. You can enjoy all the characteristics of unagi: the grilled meat is so tender and fatty while the skin is very crispy, and the original savory and sweet sauce completes the most exquisite taste of unagi.Enjoy lunch or dinner in the homey atmosphere at Shiki located 2-minute walk from Shuzenji Station.